An innovative side-by-side from the renowned Spanish gunmakers AYA has just arrived in the UK, but what will semi-auto fan Shane Robinson make of it? I’m sure that at one stage in most shooters’ careers there would be a side-by-side in the gun cabinet, and if I had a pound for everyone that was an AYA I’d be a rich man. I had one when I was younger. My trusty old Yeoman served me well, but when I bought my first semi-auto it was relegated to the back of the cabinet. AYA came to British shores in the late 1950s courtesy of brothers Peter and Andrew King. They saw the quality Spanish maker as an affordable alternative to the more expensive hand-built English sporting guns. 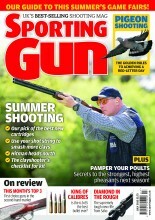 Now run by Edward King, Anglo Spanish Imports (ASI)buys in numerous sporting brands, including Rizzini and Crosman. I was asked to take a look at the new AYA Sfera shotgun. It’s not cheap, costing around £12,345, but to put the price into context, it is relatively affordable when you consider how much would you pay for a hand-built English gun. And the Sfera is a lovely looking piece of hardware. Its curved lockplates are unique to AYA, and indeed the name Sfera comes from this technical innovation. Available in an array of options from 12,16,20,28 and .410, and with barrel lengths from 25in to 32in, there is a model to suit everyone’s tastes. I was sent a 12-bore with 30in barrels. I was immediately taken with the gun once I’d assembled it. The barrels were beautifully made, as you would expect from a handmade gun. The blued and polished finish is a classic look that AYA was keen to keep on this gun. The Game rib tapered from 7mm down to 5mm and lined up nicely to the brass bead foresight. The furniture was an attractive piece of high-grade walnut with a lovely little splinter fore-end. The gun was really beautifully made and the wood to metal fit was incredibly impressive. There was not one thing out of place. Everything was snug and no gaps were to be found, no matter how hard I tried. This is what you get from having a hand-built gun. The expertise was clear to see on every piece of it. The new design aspect of the Sfera was not only on the round action but also the curved lockplate. I really would have loved to take a look inside the metalwork but as it was a test gun, I was too scared to commit the cardinal gunsmithing error of rounding those beautiful screw heads. The combination of elegance and technology works fantastically on this gun. The case hardened action was cracking. I’m a sucker for case hardening. The intricate scrollwork with the gold inlay on the bottom of the action was a lovely touch. Never too gaudy, just a classic look that works nicely. AYA has kept the double trigger with the front being articulated. Again, this is in keeping with classic old game gun look and feel. The gun was really finely balanced, even with the longer 30in barrels. I can imagine the 28in would be a handy tool to take on any driven day. It shot beautifully and I was impressed at how well I scored with it. I’m not a regular side-by-side shooter and the sight picture messes with my head on crossing birds (looking down two barrels instead of one) but the gun just fitted me really well and the shot flowed nicely. Standard clay loads on the test ground worked well as did the standard 32g 5 shot game loads, but the bigger loads 36g 4 shot thumped a little. As a result I could see that after a big drive I may be in need of a good physio. But that’s not unheard of when shooting lighter side-by-sides, which don’t have the weight to absorb the recoil like some over-and-unders.